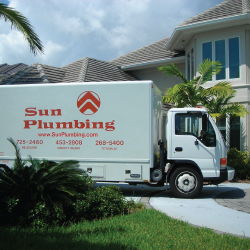 Locally owned, Sun Plumbing has been serving Brevard County’s residential and commercial plumbing needs since 1974. Proud of our reputation for honesty, reliability and quality work at competitive prices, our services are fully guaranteed and our customer care polices are unmatched in our industry. We are 30 year members of The Melbourne Area Chamber of Commerce and Better Business Bureau. We believe in and fully abide by their standards and ethics. Some of our recent awards include 2016 Melbourne Fire Department’s Community Service Award, 2016 Angie’s List Super Service Award and 2010 Better Business Award from the Better Business Council. Our team of Plumbing professionals are fully licensed and ready to tackle anything from your smallest problem to your largest project. We dispatch technicians to all over Brevard County including Viera, Palm Bay, and Merritt Island. Our workmanship meets the highest standards and we use all the brand name products you are familiar with – from competitive to designer lines. Every one of our employees has passed a thorough background and motor vehicle record check as well as drug screening. Our technicians are uniformed, our trucks well stocked, computer dispatched and clearly marked with our company logo. Contact us today and see how we set the standard in Brevard County. Serving ALL your plumbing repair needs. From leaky faucets, running toilets, backed up drains and water heaters to slab leaks and re-pipes. We will be there to get the job done right the 1st time. See why we have set the standards in Brevard County for customer service, honesty and integrity. Let Sun Plumbing help make your bathroom dream a reality. 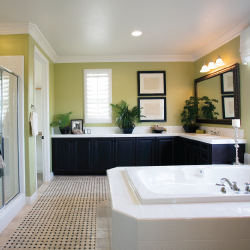 From demolition to the finishing touches, we provide COMPLETE bathroom remodeling. We can work with your licensed Building Contractor or, if you prefer, directly with you. When it comes to new construction plumbing we are proud of our reputation for setting the standard for quality plumbing in Brevard County. State certified Sun Plumbing has been providing residential & commercial new construction plumbing for over 39 years. 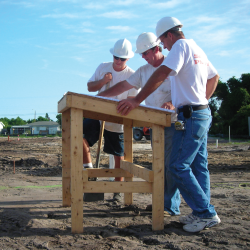 We get the job done on time and according to ALL local, county and state building codes. When pointing out the bad news of a plumbing problem, the daddy of them all is the overflowing toilet. There is nothing charming about it. To temporarily resolve a flooding toilet, the first thing to do is to slowly turn off your shut off valve to the toilet. The shut off valve is usually located by the wall under the toilet tank. Call Sun to get your toilet back to working order. If your toilet is clogged you can try to use a plunger temporarily unclog before calling Sun Plumbing. Burst pipes are a regular thing in old houses. Unfortunately, there is no quick fix, but you can prevent the water from pouring into your house anymore than it already has. Essentially, all you have to do is turn off the main water shut-off valve to your home. At the closest conceivable opportunity call Sun Plumbing to replace the broken pipe. The best route to tackle this situation is to get to under the sink and turn off the water shut-off valve. This may be behind the cabinets where the sinks plumbing runs. Admittedly, this doesn’t take care of the prevailing situation, but it permits you to have chance to call a plumber if need be. Our staff is fully certified and has passed thorough background checks and drug testing. Been serving Brevard since 1974 and we will be here to stand behind our warranty. Received 2010 Better Business Bureau’s Better Business Award. We are licensed, bonded and insured. References are available upon request. One stop shopping for all your plumbing needs. I had a water leak in my garage for over a month and I had been told everything from the “leak is caused by groundwater” to “you have a underground spring”. Even had one plumbing company come out and tell me that I didn’t have a water leak, had to be groundwater. Then I found Sun Plumbing by doing a search for Slab Leak Detection on the internet. Sun sent out Nate to tackle my water problem. I must say I was truly impressed by Nate. This guy stayed the course and never wavered. I was amazed at his tenacity. He arrived around 10:00 that morning and jumped right into determining the problem. He never took a break, worked right through lunch. Not only did he find and repair the problem but, he patched the holes in the sheetrock and concrete then cleaned up the mess.Thank you Sun Plumbing and thank you Nate! Today your company came out to find and fix a leak under the slab at my house. Nate was the plumber that came out and we were really impressed with him. He answered our questions while working and cleaned up afterwards. We were so worried we would have holes in the wall and in the floor and you wouldn’t even know we had a problem except for the one 12″ tile he had to remove! We appreciate everything he did for us and that he was so neat. Thank you Sun Plumbing!!!! Thank you for going above and beyond the call of duty to help me fix what could have become a major issue. I looked forward to working with Sun Plumbing and Mark for a long time to come. Again Thanks You Mark for a job well done. I have used Sun Plumbing for all my service needs and plumbing updates at my home over the years. I have followed the recommendations of Sun to use Ferguson’s Bath and Kitchen Gallery when choosing new fixtures. Each experience with Sun has been technically accurate, courteous, and competitively priced. I am a patron. Jeff & his partner did our septic system refurbishment and we are very pleased with their performance and customer interface. Their cleanup and work was orderly and apt. Thank you. Dear Steve: I am enclosing a token thank you for your prompt and courteous response to my recent request. I do appreciate your efforts. I write with gratitude and thanks for Sun Plumbing remodeling the bathroom at Our Lady of Lourdes School. They look beautiful now after being painted and remodeled. This has been a long overdue project. Thank you for your graciousness in doing this for our school. I would delight in doing lunch with your some day if your schedule so permits. I would like to thank Chad for his professional, courteous service in our plumbing needs. I realize this service call was challenging to say the least yet he handled the call with professionalism and kindness. Again, a special thanks for his service. I want to personally thank you for your very generous donation to the Central Brevard Humane Society. We are continually trying to expand our services and grow to provide the best care possible to all the animals that cross our door step. Becuase of the services you provided we are very close to completing our Merritt Island Satellite Adoption Center and look forward to helping more of our furry friends find a “forever home”. This letter is to express my sincere gratitude and appreciation for the services that Ed Campbell, Sun Plumbing Service Specialist, provided in detecting the water leak at my property. Ed’s determination and resilience were crucial components in identifying and addressing the problem. John is talented, quick, and efficient in multitasking his duties as estimator, designer, general contractor, and installation technician. John Ryan is also an artist. John and the others from Sun, as well as all the associate subcontractors (cabinets, tile, electrical) were very professional and finished their jobs to John’s schedule and to my very high standards. You really do help tremendously. You help a lot of the lost children out there become found, not only a home but, comfort, confidence, clothes, education, and a promise that they are truly not alone. It is my privilege to write to you about the most outstanding work I have ever had done on my 47 yr. old home. Ed Campbell and Neil LaRochelle were absolutely the nicest, most respectful, professional and capable young men that I have ever had the honor to have in my home. Just a note of thanks to your great crew of employees, and especially to Ed who diagnosed my plumbing problem in a heartbeat. We just had our drainfield replaced by Sun Plumbing and we are very pleased with their whole process. This company is top notch. All of their personnel were professional, knowledgeable and courteous. Your guys (Doug and Jeff) did a GREAT job. They were on time, knowledgeable, friendly and they worked very hard to get his unusual job done in a timely fashion. I would highly recommend your business to anyone!